The internet isn’t happy with this picture of Prince George and Lupo. Mmm. Ok.
A series of photos were released earlier this week by Kensington Palace, featuring an adorable Prince George living his best life on his third birthday. The pictures, which feature the three-year-old royal, were taken by Matt Porteous at the royal family’s country home in Norfolk and show Prince George in a stripey outfit we can totally get behind. 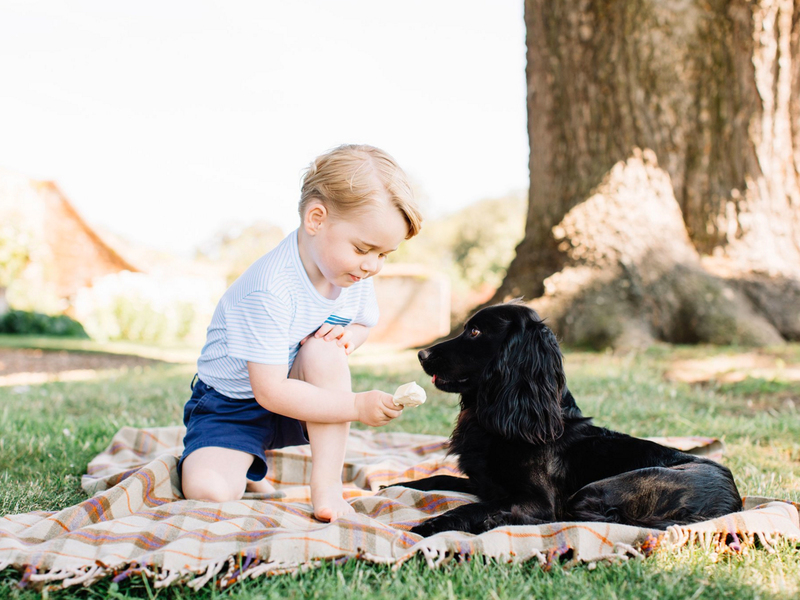 One of the pictures, features Prince George pretending to feed Lupo, the family’s beloved cocker spaniel, a bit of ice cream. Emphasis on ‘pretending’. No ice cream was actually consumed (by Lupo anyway, we’re guessing Prince George snaffled it right down). ‘Monarchist MONSTER! – Never give a dog Ice Cream! At worst: it’ll die, At best: the dog will diarrhea everywhere!’ @MyOpinionPod wrote. ‘Two complaints about Prince George’s official photos: you shouldn’t feed dogs ice cream, and the monarchy is an archaic & undemocratic insti’, tweeted @rdouglasjohnson. In response to the furore, The RSPCA told the MailOnline: ‘It is lovely that Prince George is trying to help keep his family dog, Lupo, cool in these high temperatures. ‘[But] we would advise people to be cautious when giving their dogs food meant for human consumption as some items, like chocolate, can be highly toxic to dogs and dairy items can be difficult for them to digest. Amongst all this noise, The Palace had a very dignified statement. ‘The Duke and Duchess hope that people will enjoy seeing these new photographs. They would like to thank everyone for all the lovely messages they have received as Prince George celebrates his third birthday.’ Hear hear.